B&P Manufacturing has been engineering and building the highest quality material handling products since 1943. We continually make major investments in new equipment, software and engineering with one goal in mind; to offer our customers the best built, best backed products in the industry. Our products are all engineered, designed and manufactured in Cadillac, Michigan and are made to the highest quality specifications. We offer exclusive warranties and unique designs that can’t be found anywhere else. The products at B&P are superior in quality and durability because we use the highest strength aluminum, strongest rivets and most advanced manufacturing processes. 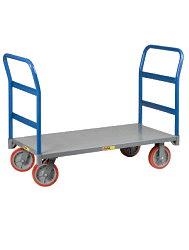 Simply put, B&P manufactures the best built and best backed material handling equipment in the industry. This hand truck has wheels made of the highest quality materials with a 3 year warranty to back them up. Extruded axel brackets aslo come with a lifetime warranty. The axel is made of 91,000 PSI tensile steel making it super strong for heavy loads. The nose plate is constructed of extruded aluminum for longer life. The frame is constructed of lightweight aluminum boosting a 600 lb capacity. The frame cross members are four sided ribbed construction and add exceptional support to an already strong frame. 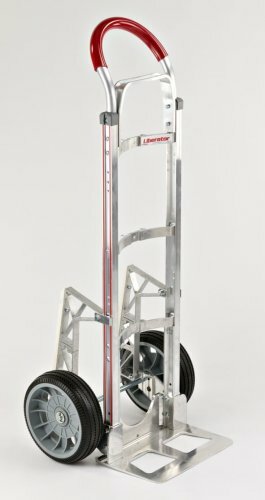 The rivets used to construct the hand truck are made of 700 lb aircraft grade aluminum for long life stability and durability. Parts are interchangeable with most competitor's models. Curved frame for carrying kegs, clyinders, and any clylindrical objects. Dimensions 50" x 21" x 18.5"